Play in Bodog’s Beginner Tournaments – 10% Instant Deposit Bonus! Online poker tournaments are becoming more and more popular these days, evident by PokerStars record breaking tournament in July 2009, which received over 65,000 entrants all gunning for $130,000 in guaranteed cash prizes. However, playing in the biggest tournaments with large competitive fields is not the best strategy for beginner tournament players because they are incredibly difficult to finish in the money. Take PokerStars legendary Sunday $1.5 million guaranteed for example, where over 7,000 entrants compete for this on average, many of them the most recognised online MTT players in the world. Hence, starting out in a $535 buy-in high stakes tournament like this is not the best idea for young players starting out. Which is the Best Tournament Site for New Players? Having been there and experienced it myself, I recommend playing the low stakes MTTs at Bodog, most of these are in the $1 – $10 buy-in range and run every few minutes. Bodog’s tournaments are the best for beginners because all of their daily guaranteed tournaments have very low entry fields and added value overlays. This makes them great for new players because it gives you a better chance of winning and cashing out quickly. The lower the fields, the easier it is to make money, and with big juicy overlays knocking at your door you’d have to be insane not to take advantage. Bodog runs lots of poker tournaments designed for new players. Their so-called “Beginner Tournaments” are proof of this. Normally at a poker site, the poker tournaments only reward the top 8% – 15% of finishes which makes grinding your way to a payoff day pretty hard. This can take its toll on any new players bankroll. Bodog have remedied this by providing Beginner Tournaments that payoff twice as many places. Bodog’s Beginner tournments are scheduled every day and have a small $4 + $0.40 buy-in that won’t burden your pockets. In terms of recommending these to new players, they’re pretty impressive because the fields are extremely weak and you have a great chance of doing well in them. Other than Bodog’s daily overlays and beginner tournaments, new players can enter the annual Bodog Mini-series that runs an mini “FTOPS” style tournament series that includes 13x $10 buy-in MTTs designed for micro-stakes players and beginners. With $40,000 available in guaranteed prizes and leaderboards, this gives you an extra reason to scoot around at Bodog. 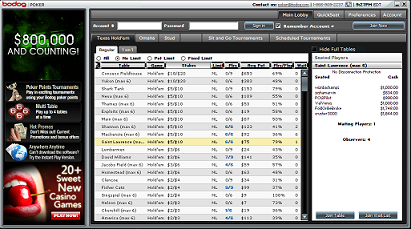 You can also find regular WSOP satellites with competition much easier than PokerStars or Full Tilt Poker’s. Play Beginner Tournaments at Bodog Poker – 10% Instant Deposit Bonus plus 100% up to $1,100!